Harajuku teen student sporting a casual look while out and about on the street. 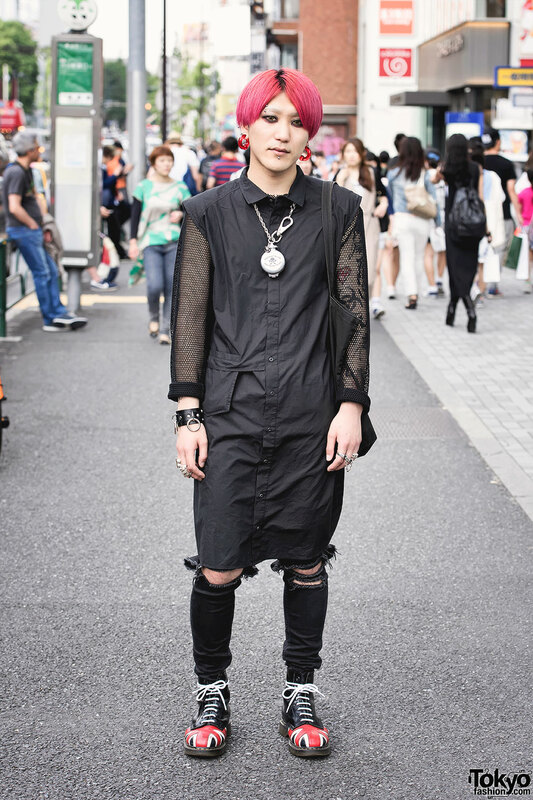 Harajuku guy with pink hair and facial piercings, a long black Comme Des Garcons top, ripped jeans, and Union Jack boots. 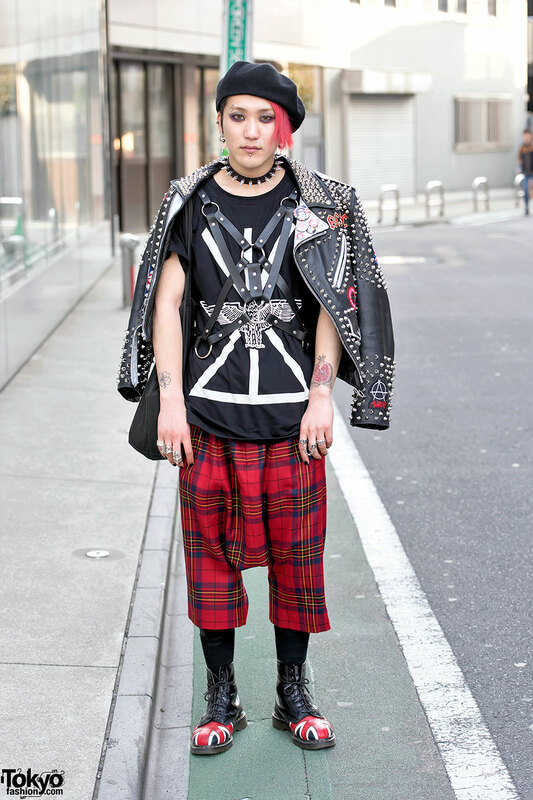 Harajuku guy in punk style with customized leather jacket, plaid Comme Des Garcons pants, Dr. Martens boots, and piercings. Harajuku girl with pink twin tails and heart shaped sunglasses wearing a bowling shirt with a red mini skirt and jacket, striped over the knee socks, purse and cross strap platforms. Harajuku girl with pink and purple twin tails wearing a bones t-shirt with a ruffle skirt, choker, razorblade necklace, owl jewelry, headband, 13 bag and knee length buckle boots. 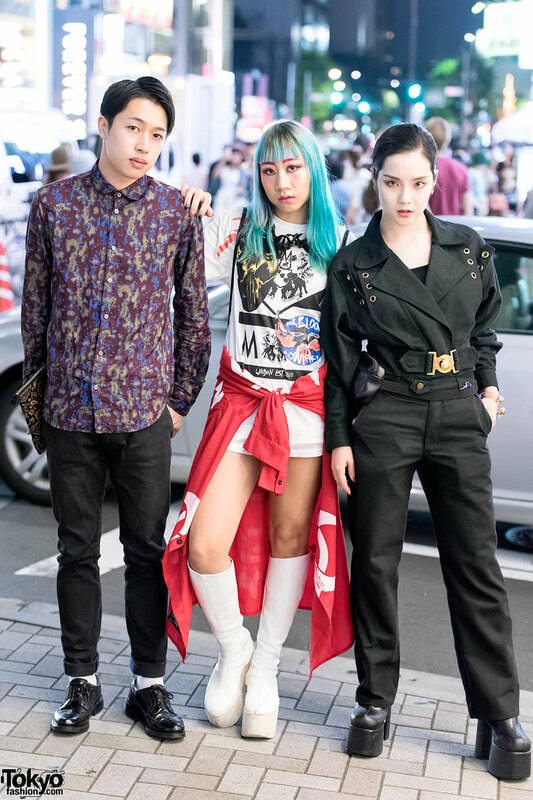 Japanese guitarist Lisa 13 on the street in Harajuku with pink dip dye hair, a pink biker jacket, mini-skirt, and tall Demonia buckle boots.